Natriuretic peptides (NPs) are synthesized and secreted through certain mechanisms by cardiomyocytes, fibroblasts, endotheliocytes, immune cells (neutrophils, T-cells and macrophages) and immature cells (embryonic stem cells, muscle satellite cells and cardiac precursor cells). They are mainly produced by cardiovascular, brain and renal tissues in response to wall stretch and other causes. NPs provide natriuresis, diuresis, vasodilation, antiproliferation, antihypertrophy, antifibrosis and other cardiometabolic protection. NPs represent body’s own antihypertensive system, and provide compensatory protection to counterbalance vasoconstrictor, mitogenic, sodium-retaining hormones, released by renin-angiotensin-aldosterone system (RAAS) and sympathetic nervous system (SNS). NPs play central roles in the regulation of heart failure (HF), and are inactivated through not only NP receptor-C, but also neutral endopeptidase (NEP), dipeptidyl peptidase-4 and insulin degrading enzyme. Both BNP and N-terminal proBNP are useful biomarkers not only for diagnosis and severity of HF, but also to guide the therapy and predict the prognosis in patients with HF. 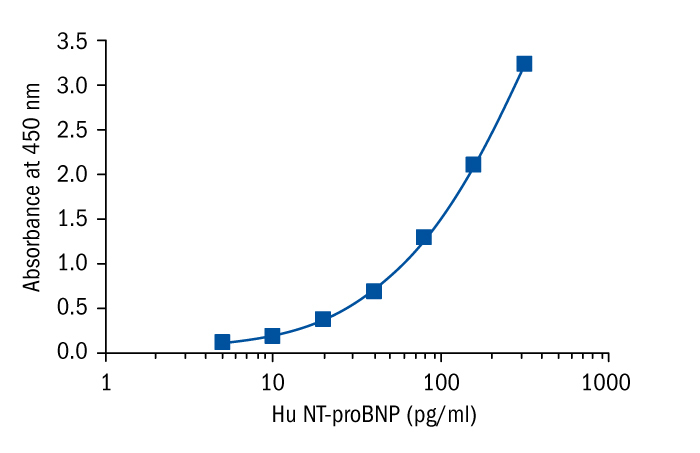 NT-proBNP (N-terminal pro-B-type natriuretic peptide) is an inactive and stable amino acid fragment co-secreted alongside the neuroendocrine peptide BNP from the ventricular cardiac myocytes. It is released in response to left ventricular strain or ischaemia and has been found to be an important biomarker for left ventricular systolic dysfunction and left ventricular stress in the general population. NT-proBNP is predominantly cleared by the kidneys, and has a longer half-life than BNP (1-2 h vs. 20 min) leading to higher circulating levels and greater stability. Because NT-proBNP is metabolized in the kidneys, the serum level of NT-proBNP can be increased in patients with diseases that damage renal function. Elevated levels of NT-pro BNP were described in patients with different cardiovascular pathologies such as heart failure, myocardial infarction and pulmonary embolism, acute or chronic cor pulmonale, acute dyspnea, and also in patients with non-cardiac pathologies, e.g. anemia, chronic renal failure or sepsis. NT-proBNP may predict heart failure in children with sepsis. In addition, it provides an important clinical reference for the diagnosis of heart failure in pediatric patients with sepsis, and enables monitoring septic children for cardiac involvement. In recent years, NT-proBNP has been found to be an excellent predictor of cardiovascular risk and mortality in patients with diabetes and can also be used for prognostic applications in patients with acute coronary syndrome. Measuring NT- proBNP in primary care patients with suspected heart failure identified those with substantial increases in the risk of hospitalization for cardiovascular disease and death. Thus, NT-pro BNP is an ideal biomarker for heart failure in the primary care setting.